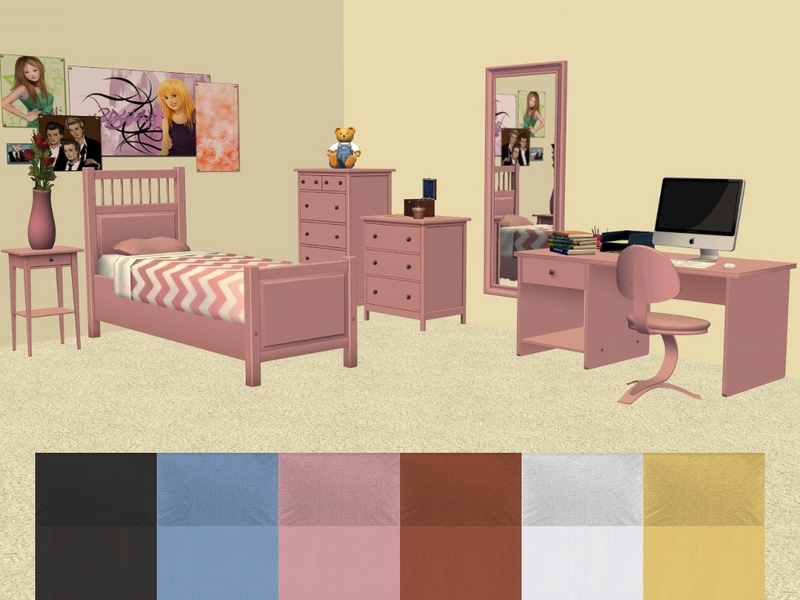 In this upload you will get the entire HEMNES collection in Pink (double bed also recolours the single bed), the 'HEMNES Mirror' in Yellow & Red, the 'BILLY Bookcase' in Yellow, Red, Pink & Blue, the Base Game 'Stark Inspiration Chair', 'Retratech "Office Pal" Economy Desk' & plain bedding in all 6 colours. 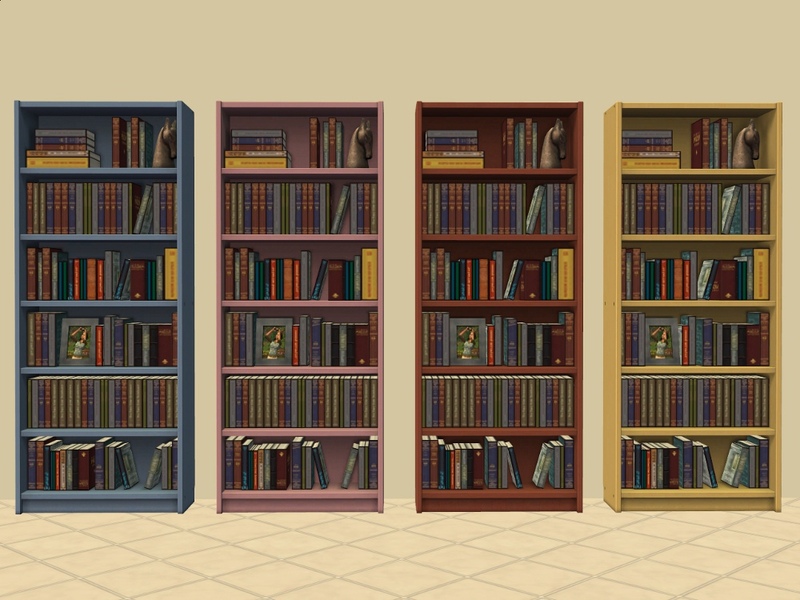 The 'BILLY bookcase' was a late addition, that's why it was not included in my screenshots. 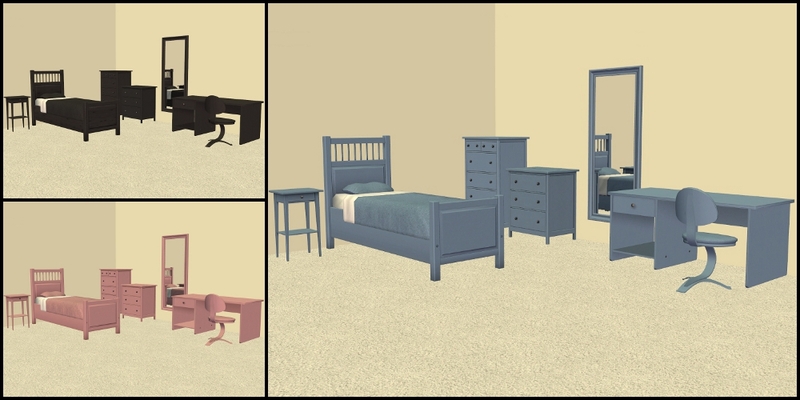 If you like the HEMNES set you might be interested in HEMNES Add-ons by shakeshaft and Slaved by mustluvcatz also IKEA Hemnes Bedroom by HugeLunatic, IKEA Hemnes Office by HugeLunatic, slaved Hemnes table set by Karas & HEMNES desk add on for The Sims by TheNinthWave. 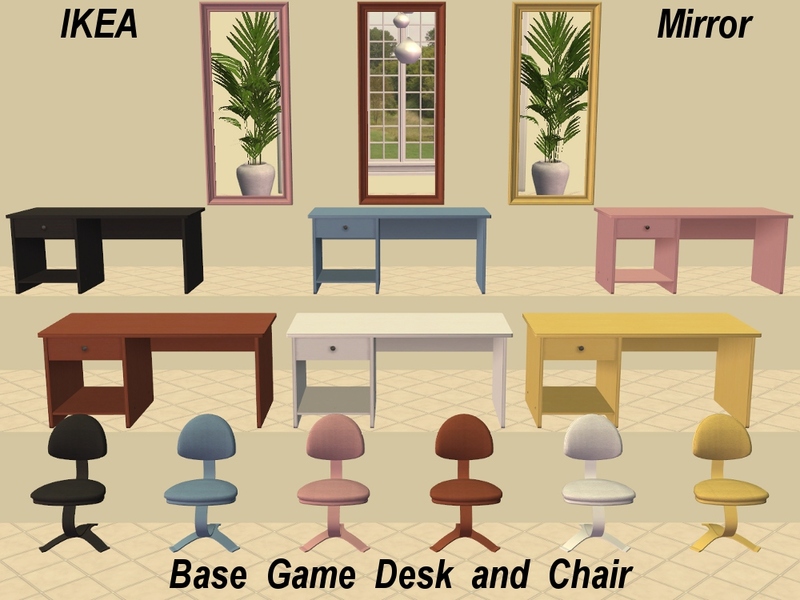 6 Retratech "Office Pal" Economy Desk - Found: Buy Mode > Surfaces > Desks. Price: §80. 6 Stark Inspiration Chair - Found: Buy Mode > Comfort > Dining Chairs. Price: §800. 4 BILLY Bookcase - Found: Buy Mode > Hobbies > Knowledge. Price: §190. 3 HEMNES Mirror - Found: Buy Mode > Decorative > Mirrors. Price: §150. 1 HEMNES Bedframe-Single - Found: Buy Mode > Comfort > Beds. Price: §480. 1 HEMNES Bedframe-Double - Found: Buy Mode > Comfort > Beds. Price: §730. 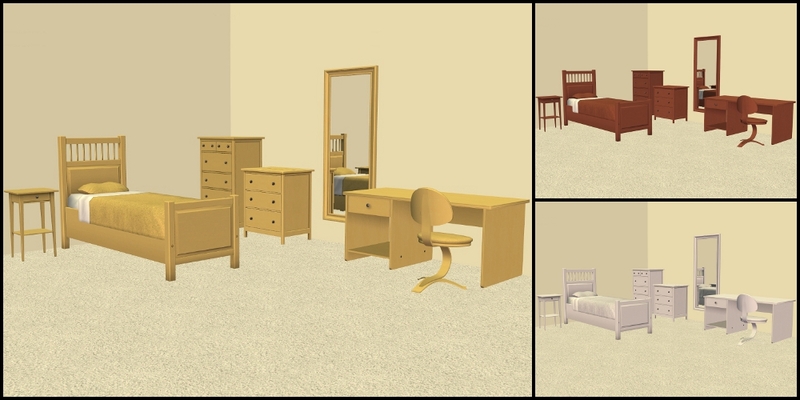 1 HEMNES Bedside Table-Square - Found: Buy Mode > Surfaces > End Tables. Price: §75. 1 HEMNES Bedside Table-Round - Found: Buy Mode > Surfaces > End Tables. Price: §145. 1 HEMNES Chest of 3 Drawers - Found: Buy Mode > Miscellaneous > Dressers. Price: §220. 1 HEMNES Chest of 6 Drawers - Found: Buy Mode > Miscellaneous > Dressers. Price: §340. Thank you very much! Especially for the seat covers which will go great with wood combinations. Thank you for these! I can never have too many IKEA recols - and the basegame desk and chair are some of the ones I use the most, so that was a v. nice bonus. Great colour options. Thank you very much.